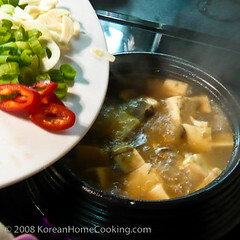 There are several variations of soybean paste stew you could make. I mentioned in my previous post that you could make soybean stew practically with any ingredients you want whether you are a vegetarian or a meat eater. You could also make the stew more like a watery soup by adding plenty of water and serve it as a side soup next to your steamed rice. Or, you could make it thick with just little bit of added water. 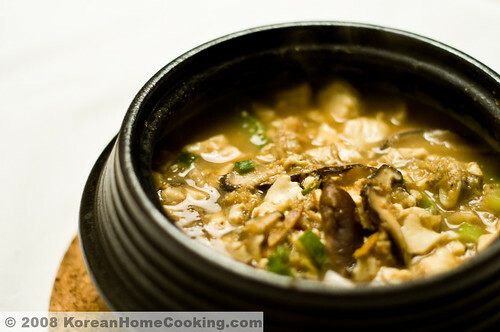 One of special ways to enjoy thick soybean paste stew is to mix it with steamed rice in a large bowl together with some fresh vegetables and little bit of red pepper paste. 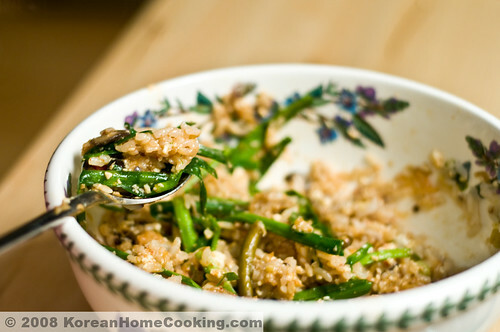 It will make an instant bibimbap, a form of popular Korean dish which literally means "mixed/stirred rice" or "mixed/ stirred meal". 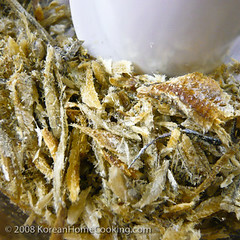 Remove the head and entrails (dark in color) from dry anchovies. Though I normally use whole anchovies for making soup stock, in this recipe, it's necessary to clean each anchovy because they are ground and are added to the soup directly. 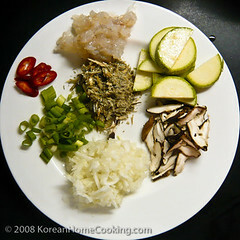 Chop shrimps, onion and scallion, and slice zucchini, mushrooms and some red pepper. 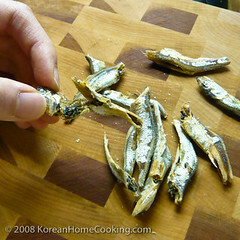 In high heat, add prepared dry anchovies, shrimps, mushrooms and zucchini to a pot. 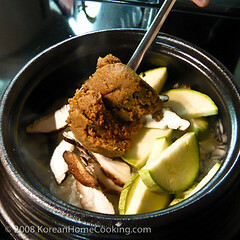 Add water (1 cup) and soybean paste (1 1/2 tbl), and bring it boil. 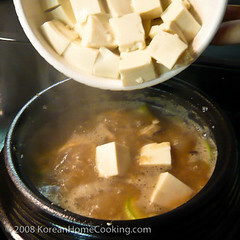 When the stew starts boiling, add tofu. 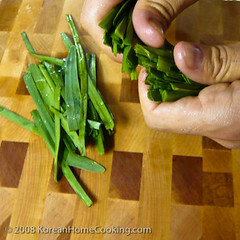 Add chopped scallion, chilies and garlic for seasoning shortly after, and cook for 5 to 10 minutes over medium heat. 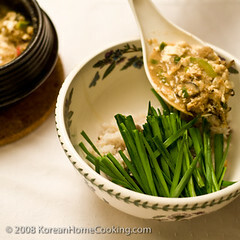 Place some fresh vegetables like garlic chives or arugula leaves over steamed rice. 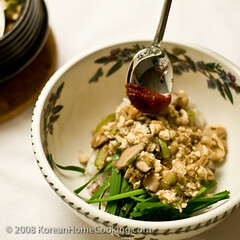 Add a scoop of thick soybean paste stew. Add little bit of red pepper paste for seasoning. Looks like a great vegetarian meal and so healthy, too! You are likely to even so see such vinaigrette lockets in the marketplace presently. As well as increasingly being patek philippe replica, many develop a suitable section of charms to always be passed typically the versions. Personally engraved lockets through Silver antique. During the versions lockets are generally edited to varying general trends whereas continuing to keep available approach an identical. Should you desire some rado replica watches on a young lady maybe babe, you might even give consideration to silver antique lockets which were engraved manually ,. Such lockets are loaded with attractive flowery concepts which were ordinarily gorgeous. For everybody who is bearing in mind lockets of that category, there are actually that this rolex replica sale are actually an abundance. Time honored lockets. Should you desire a gift which may be popular, therefore you should think about typically the time honored locket constructed from silver antique. This unique time honored section of silver antique charms is probably the initial thing which may get to your brain when ever a professional says some silver antique locket. Presently you can buy such lockets through silver antique of this tag heuer replica uk good that will not tarnish. You are likely to perhaps even see products aided by the centre section in your forward constructed of some conclusion from wonderful satin. Due to its terrific good, this unique locket even will make an ideal heirloom device. Custom fake watches lockets through silver antique. Graphic lockets are actually factors behind categories. You could get silver antique lockets of that category in several not to mention different sizes.